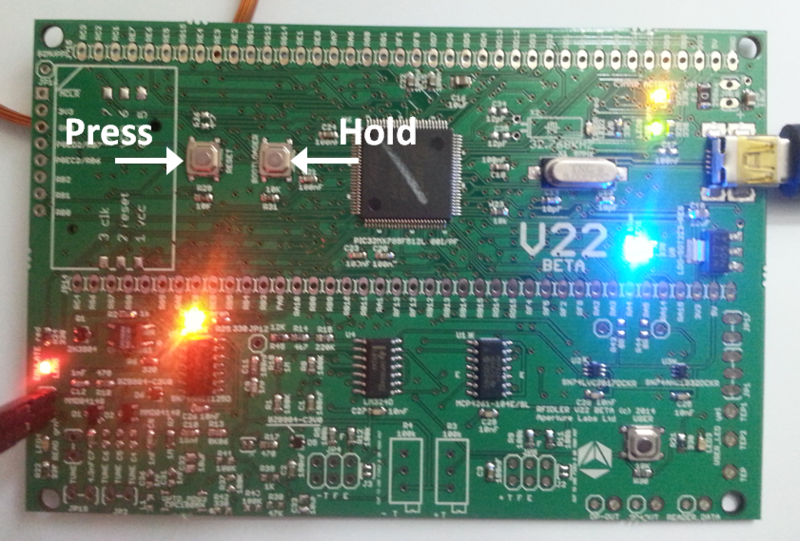 As a beat-my-tester for the RFIDler Kickstarter project, I got one of the first batch of these sweet LF RFID reader/writer/emulator units, straight from Zac Franken and Adam Laurie. 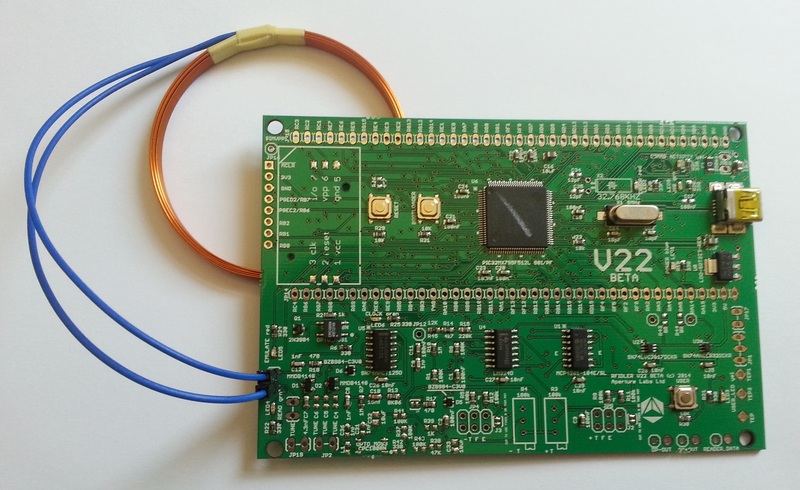 Although I have a Proxmark3 (actually, it’s not mine, it belongs to Larry Pesce, but he’s never getting it back), I am excited about the RFIDler as a low-cost alternative with active and exciting development. When the RFIDler arrived it was running alpha3 firmware, which needed to be upgraded to the latest firmware in the RFIDler GitHub repository. Flashing requires the mphidflash utility, which is available in source or binary form on Google Code. remote: Reusing existing pack: 518, done. Receiving objects: 100% (534/534), 8.90 MiB | 1001 KiB/s, done. Resolving deltas: 100% (279/279), done. To update the firmware, hold the bootloader button and press “reset”. The LED07 and LED08 LED’s will start alternating amber and green. You will also see a kernel message indicating that the device has entered into bootloader mode. A special thanks to Horst Karin for posting a great review of my new book, Hacking Exposed Wireless 2nd Edition on the ISACA website. If you haven’t already checked it out, you can browse the book through Amazon’s Page Viewer. For the first time in print, we provided an in-depth coverage of attacking and exploiting WiFi as well as ZigBee, Bluetooth and DECT technology in the approachable and understandable Hacking Exposed style. Be sure to check out our companion website to grab the online content and associated files for download. Last week at BlackHat, AirTight Networks security analyst Md Sohail Ahmad presented his findings on a vulnerability dubbed “hole196”. Affecting WPA/WPA2 Enterprise networks, this issue allows an authenticated user to manipulate other clients on the network to establish ARP spoofing attacks, to impersonate data frames from the AP or to create a DoS attack against other users. This is all through leveraging a key shared among all of the authorized clients in a wireless LAN known as the Group Temporal Key (GTK). The “hole196” bit refers to page 196 of the IEEE 802.11-2007 specification indicating that the GTK does not prevent packet forgery attacks (from an insider). The BlackHat presentation slides were distributed on the BlackHat conference CD, and since the slides lack any kind of a copyright notice, I think it’s OK for me to mirror them here. Clients who receive the message see the client as the gateway and “respond with PTKs”, which are private and which the insider can decrypt, Ahmad explains. If this attack could get a client to reveal their PTK, even requiring that the attack start from an insider perspective, then I’d be coding up an exploit tool instead of writing this post. This, however, appears to be a misquote by Wexler, or a misunderstanding by Ahmad. No-one has clarified this quote as far as I have seen. The truth behind this issue is that, well, it’s a non-issue for most organizations. Instead of mounting an ARP spoofing attack to implement a man-in-the-middle (which a wired IDS could detect), it can be done using this technique within the encrypted wireless network, evading network IDS detection. The best way to detect this attack is through a wireless IDS, of which AirTight is a leading vendor (“Yay, Capitalism!”). When significant wireless attacks emerge, I call my customers to remind them that I do get let out of my cave every now and then, and to help them understand their exposure to the attack. I don’t believe “hole196” falls into the category of significant wireless attack, so it’s back to the cave I go. For a 2nd perspective, and an excellent technical write-up, please see Glenn Fleishman’s article over at Ars Technica. In the meantime, contact me with any questions/concerns/comments. My good friend, fellow SANS instructor, sushi lover, colleague and boss, Mike Poor, has started a blog about packets over at www.packetstan.com. I’ve been working on the site and have posted a 3-part series of articles assessing the Apple FaceTime protocol. Stop by and take a look. Brad brought the FreeRADIUS-WPE patch up to date for FreeRADIUS 2.1.7, which I’ve posted in the Offensive Section. This tool still works very reliably for me, and it’s always a treat when a target wireless network is running PEAP or TTLS and I get to use it. Code is posted on the FreeRADIUS-WPE page. If you missed it, you can check out our slides from ShmooCon 2008, or the video. Update: Please also see my post about the hidden page for advanced MiFi configuration settings. Recently, I picked up a Verizon MiFi device for $50 and the extension of my service contract for another 2 years. The fun that I’ve had with the device so far has well made up for both costs. The MiFi is a battery-powered 802.11b/g AP slightly smaller than an iPhone that features an integrated EV-DO uplink. This device replaced my former USB EV-DO WAN card*, allowing me to share the EV-DO connectivity with multiple devices over WiFi. It’s been immensely useful since I commonly travel with 3 laptops, not to mention additional mobile devices. From a security perspective, the MiFi device uses a unique WPA pre-shared key (PSK) for authentication with the TKIP cipher for encryption. It’s unclear why the device doesn’t use WPA2-PSK authentication with the AES-CCMP cipher; perhaps it was a security trade-off by the manufacturer to maintain the greatest possibility compatibility with legacy devices that only support WPA-PSK/TKIP. 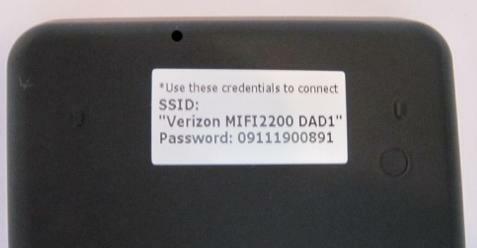 On the reverse side of the MiFi is a label, identifying the default SSID and PSK used for authentication. Besides the obvious marketing angle Verizon gets from including its name in the SSID, this allows the user to quickly identify and connect to their personal WiFi network to leverage the EV-DO uplink. Like any good hacker, I turn to the tools that I know to be tried and true. Kismet is a powerful assessment and evaluation tool for wireless networks, providing additional insight into the MiFi wireless LAN interface. Cursory analysis of the beacon information elements don’t reveal anything particularly interesting, though the Kismet screen-shot gives us a point of correlation. The MiFi SSID on my product is “Verizon MiFi DAD1 Secure”, slightly different than that of the MiFi device label (where Kismet reports the addition of ” Secure” to the SSID, and the mixed-case “MiFi”, which is important to us). Also, we can see that the “DAD1” in the SSID matches the last two bytes of the AP’s MAC address (or Basic Service Set Identifier – BSSID). From this we can determine that Verizon has no more than 65,536 unique SSID’s for MiFi devices (potentially less; more data is needed to determine if all 16-bits of the BSSID are evenly distributed among devices). Manufacture Year: “09” represents the 2-character year of manufacture. Manufacture Month: “11” represents the 2-character month code. Manufacture Day? : “19” represents the 2-character day code (NB: This could be wrong, one sample had a value of “34” here, need more data). Sequential Identifier: “00891” represents the 5-character sequential identifier code. Based on this assessment, we can determine that the password selection for the MiFi default is weak. Instead of 11 numeric values with an effective entropy of approximately 36 bits, the MiFi password only has an effective entropy of less than 17 bits for a given 6-byte prefix. If the concept of a manufacture date-stamp is true for the 6-byte prefix, then we have a relatively small search space to find the default MiFi PSK. Knowing that for a given 6-byte password prefix there are only 100,000 possible passwords, we can get down to exploiting a given MiFi device. We don’t know how many 6-byte prefixes are in use, but that’s where YOU THE READER come in. Please let me know what prefixes you see on your individual devices, and I’ll add them to the attack set. print "Must specify the 6-digit manufacture date (e.g. \"091119\")." You can download this source as mifi-passgen.py. Running this script and redirecting it to a file (e.g. “./mifi-passgen.py 091118 091119 091120 091121 >mifi-wordlist.txt”) allows us to pass it to your favorite WPA cracking tool. a connected wireless client (-c ). Returning to the Airodump-ng window, we can see that it has observed a WPA handshake, identifying the MAC address of the MiFi AP. Terminate the Airodump-ng session by issuing “CTRL+C”. root@bt:~# cowpatty -r mifi-dad1-01.cap -f mifi-wordlist.txt -s "Verizon MiFi2200 DAD1 Secure"
cowpatty 4.6 - WPA-PSK dictionary attack. 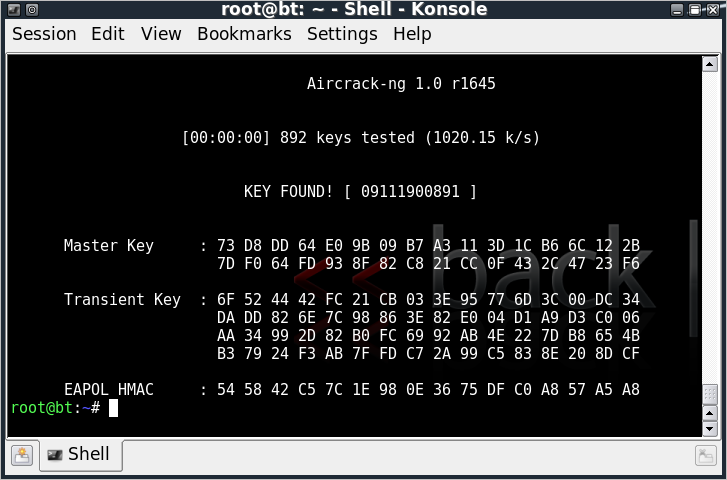 Collected all necessary data to mount crack against WPA/PSK passphrase. Starting dictionary attack. Please be patient. This is fun and evil and all, but we can get even more evil, can’t we? We know that WPA/WPA2-PSK networks are vulnerable to offline dictionary attacks, despite the efforts of the IEEE 802.11 committee to thwart the attack by reducing the speed of password guessing. Manipulating this mechanism, tools such as coWPAtty’s “genpmk” and Aircrack-ng’s “Airolib-ng” spend up-front time precomputing all the possible key guesses in a dictionary file, accelerating the cracking time when the attack is implemented. A limiting factor in this precomputation attack is that all the password guesses need to be computed for each unique SSID. 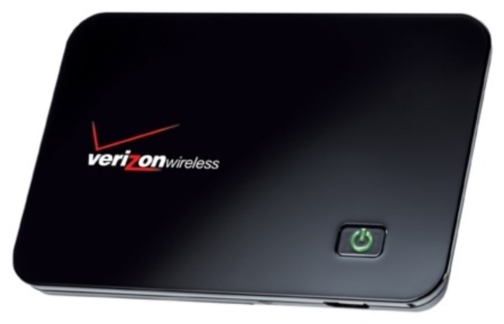 Recall that the MiFi SSID is in the form “Verizon MiFi2200 ???? Secure”, where the SSID is the same for each device with the exception of the 4 ASCII characters representing last 2 bytes of the wireless BSSID. With only 2 bytes difference between each SSID, there is a limit of 65,536 potential SSID’s. Using the WPA/WPA2-PSK precomputation attack, we can precompute the password guesses based on the manufacture date and sequential identifier for each of the 65K SSID’s. Once this is precomputed, it becomes possible to recover the password for any default MiFi configuration in a matter of seconds. Leveraging standard host CPU’s, it might take a long time to precompute all the password guesses for each of the 65K SSID’s. Fortunately, we aren’t constrained to the speed of common CPU’s. While coWPAtty and Aircrack-ng made strides in improving the speed of attacking WPA/WPA2-PSK networks, they pale in comparison to the excellent work of Lukas Lueg and the Pyrit project. Pyrit leverages both the performance of standard CPU’s for precomputing password guesses for PSK networks, as well as the impressive computing power of video accelerators, including the Nvidia CUDA line. If we assume there are 12 manufacture date prefixes, we are left with a password list of 1.2 million entries. Computing all the possible password hashes for each of the 65K SSID’s on a Core2Duo 2.5 GHz SSE2 would take almost two years to complete. Leveraging 4 GeForce 295 CUDA cards on a single host would require only 10.2 days. Once the SSID’s have been loaded, we can load the passwords into the Pyrit database as well. Returning to the mifi-passgen.py script, we can pipe the output directly to Pyrit, as shown. Connecting to storage at 'sqlite:////Users/josh/hack/MiFi-PSK/mifi-psk.db'...  connected. Processed 2/256 workunits so far (0.8%); 480 PMKs per second. The great part is that this only needs to be done once. It could take days or weeks depending on your available hardware, but once it is complete, it can be used by anyone to recover the default password on any MiFi device. To leverage the Pyrit database, we can use the “attack_db” option with our packet capture, as shown. 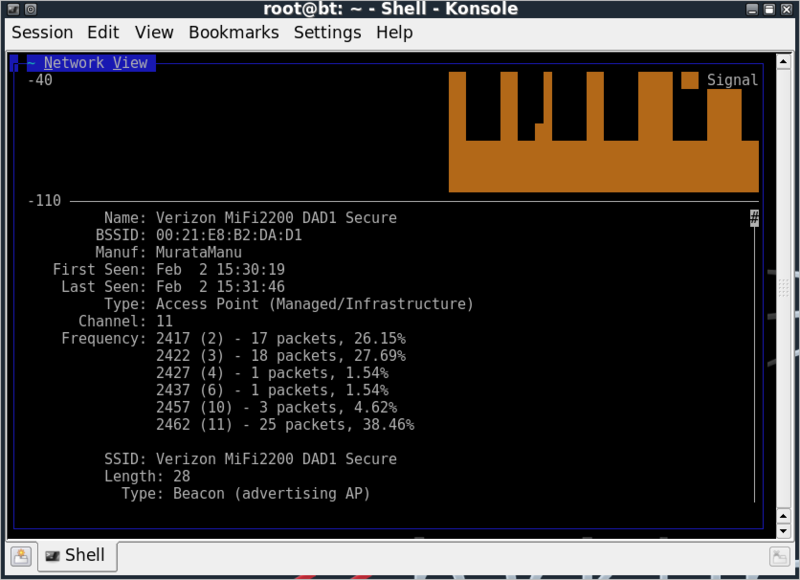 Picked AccessPoint 00:21:e8:b2:da:d1 ('Verizon MiFi2200 DAD1 Secure') automatically. Tried 57504 PMKs so far (57.4%); 107722 PMKs per second.. Utilization Fees: Verizon limits users to 5 GB data transfer a month over EV-DO account; exceeding this watermark racks up significant fees for the end-user. A neer-do-well could compromise a MiFi device and leverage it for their download purposes, potentially avoiding racking up their own Internet use charges, or just to cause trouble for the victim. Client Attack: For organizations deploying MiFi devices for their road-warriors, an attacker may compromise the PSK on the MiFi wireless interface for the opportunity to exploit the client devices using the network interface. This may be in an effort to gain access to a system over a weak network interface, allowing them to return to their more secure network to attack other internal hosts. Traffic Decryption: If an attacker can identify the correct PSK for the MiFi network, then they can also decrypt all the traffic on the network with Wireshark or Airdecap-ng. This could be used to passively collect sensitive information, or to actively exploit the client browser or other network traffic. Fortunately, there are a couple of options available to us to mitigate this attack. Change the Default PSK: Before deploying the MiFi device, be sure to change the PSK to a non-default value. The IEEE 802.11-2007 specification reads “A key generated from a passphrase of less than about 20 characters is unlikely to deter attacks.”; I think this is good advice. Change the Default SSID: Change the default SSID from “Verizon MiFi2200 XXXX Secure” to another value that is not common, but not unique either (somewhere in the middle) to mitigate precomputed PSK attacks, as well as general wireless anonymity attacks. Enteprise organizations and end-users alike should apply both these recommendations to thwart attacks against the MiFi deficiency in password selection, as well as weaknesses in WPA/WPA2-PSK in general. The Verizon MiFi is a great tool, but the engineering team who created the default password mechanism should have taken into consideration the limited entropy in the selection of passwords, and the well-publicized attacks against WPA-PSK networks to limit customer exposure. Coincidentally, this is a topic we examine in my SANS Institute Ethical Hacking Wireless course, where we dig into a variety of wireless systems including WiFi, Bluetooth, WiMAX, GSM, proprietary protocols and more. If you are interested in wireless security topics, I recommend you check out the course sample or sign right up for the biggest SANS conference of the year in Orlando, FL, March 8th – 13th. Questions, comments, concerns? Please drop me a note. Special thanks to Lukas Lueg, John Strand and my fellow agents at InGuardians. Thanks guys! * On an hourly basis, this is the message my last Verizon USB EV-DO card gave me. The screen-shot says it all. Yesterday I presented my findings on the security implications of the ZigBee protocol at ToorCon 11. I had a great audience and the presentation went smoothly where we looked at the basis of ZigBee technology and why ZigBee is important for embedded developers and interesting to attackers. I also introduced a new project I’ve been working on dubbed KillerBee. KillerBee is a Python-based framework with several tools designed to exploit deficiencies in the design and implementation of ZigBee and IEEE 802.15.4 networks. The hardware I’m using with KillerBee is the AVR RZUSB stick, available from electronics resellers such as DigiKey and Mouser for $40/USD. I’m still working on KillerBee, and it’s not quite ready for prime time yet. I’m planning on doing a full release at ShmooCon, so if you are interested in doing some hands-on ZigBee hacking at Shmoo, pick up a few RZUSB sticks and come find me at the InGuardians booth. I had a bunch of CD’s printed up and distributed at ToorCon for an early preview of KillerBee, sample packet captures, specification documentation and more. If you want to get a copy of that, please drop me a note. In the meantime, you can grab my slides from the presentation. I’d love to hear feedback on ZigBee and what people are doing with this technology, so drop me a note and let’s chat. On Saturday at ToorCon 11 I’m presenting my work in designing a framework and tools to exploit and manipulate ZigBee and IEEE 802.15.4 networks. KillerBee has been about 9 months in development, written in Python, leveraging the AVR RZUSB Stick as the interface to interact with these low-power networks. ZigBee is a interesting wireless technology, not due to any particularly innovative design mechanisms (and certainly not from a robust security perspective) but because it interfaces with the kinetic world more than any other wireless protocol I’ve run into. It would be unheard of to use WiFi as a mechanism to control gas valves in distribution mains, and you would never see Bluetooth controlling a flood release main, yet ZigBee and IEEE 802.15.4 seem to fit in with these scenarios, often with little in the way of mature security testing. My hope is that people evaluating ZigBee and IEEE 802.15.4 technology will be able to leverage KillerBee as a platform to test third-party products (and, for vendors, to test their own products) for vulnerabilities. In my presentation on Saturday, I’ll detail several examples of how I’ve been using KillerBee for this purpose, and how you can as well. After the conference I’ll post my slides here, so stay tuned. If you are coming to ToorCon, please be sure to stop by and say “Hi”. The Bluetooth Service Discovery Protocol (SDP) is used to publish and enumerate the services of a Bluetooth device. Through SDP, your mobile phone knows that your Mac accepts file transfers or can extend your wired network over Bluetooth, for example. This output shows us that the target is publishing the OBEX File Transfer service (the target is a Windows Mobile phone). The developer who implemented this profile gave it the service name “FTP”, which is what you would see in a typical GUI interface to identify this service. Notice the data following the Language Base Attribute List, “code_ISO639”. This field is referring to ISO specification 639:1988 (E/F), used to denote a 2-letter code for the language used to denote human-readable fields associated with this service. This language code will often correspond to the language pack on the host operating system. In this example, the value 0x656e corresponds corresponds to the hexadecimal equivalent of the ASCII letters “en”, denoting the English language used on this system. I find this information very useful since it helps me in selecting the right exploit for the target, using my two favorite penetration testing tools, the Metasploit Framework and Core IMPACT. I’ve modified the ISO specification to also include the hexadecimal values for the language code, making it easy to interpret the output from sdptool, available Projects section. If anyone finds the language code 0x656f, please drop me a note. Special Evening Webcast on Kismet Newcore Thursday! On Thursday night at 7pm EDT (4pm PDT) I’ll be giving a special evening webcast called “Budget Wireless Assessment using Kismet-Newcore“. I delivered this content at the SANS Denver conference a few weeks ago, but several people have contacted me complaining that they wanted to get in on the new features Kismet has to offer including plugins, new security framework, the new user interface, integrated graph views and more. For example, did you know that Kismet Newcore has the ability to apply fine-grained channel hopping controls, allowing you to easily configure Kismet to spend more time on commonly used channels (such as channels 1, 6 and 11)? This allows you to focus the data collection process while not missing any AP’s that might on uncommon channels. The webcast will use the SANS vLive! (formerly @Home) setup based on Elluminate. This software gives me the ability to do live demonstrations during the webcast with a Q+A interface and the ability for viewers to ask questions during the session. What’s more, attendees will get a 10% discount code off my upcoming Ethical Hacking Wireless course, delivered in manageable 3-hour chunks once a week for 12 weeks, starting September 7th. More information on the Ethical Hacking Wireless vLive! course is available at http://www.sans.org/athome/details.php?nid=19608.